Our team includes cardiologists, registered nurses, a registered respiratory therapist, and a registered and licensed dietitian. Cardiac Rehab uses structured, progressive exercise to strengthen the heart muscle. Our patients are monitored using telemetry, which gives real-time ECG readings at rest and during exercise. 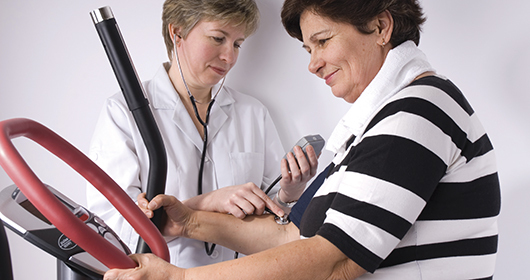 Blood pressure is also monitored at rest and during exercise. These readings are used to help guide the doctors and nurses in your continued care and progress throughout your recovery. Through education provided in Cardiac Rehab by our dietitian and our nursing staff, our patients learn healthy lifestyle changes to decrease further risk of heart problems. For more information on our Cardiac Rehabilitation program, please call 334-793-8025.